The Supreme Court will release orders from the April 12 conference on Monday at 9:30 a.m.; John Elwood’s Relist Watch compiles that petitions that were likely relisted for this conference. On Monday, the justices hear oral argument in Iancu v. Brunetti and Emulex Corp. v. Varjabedian. 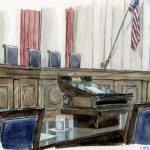 On Tuesday, the justices hear oral argument in Parker Drilling Management Services, Ltd. v. Newton and North Carolina Department of Revenue v. The Kimberley Rice Kaestner 1992 Family Trust. On Wednesday, the justices hear oral argument in United States v. Davis and McDonough v. Smith. On Thursday, the justices meet for their April 18 conference.